High-resolution observations from Hubble have shed light on the real mass of a star previously believed to be amongst the heaviest known in our Milky Way. Originally, the mass of the star was thought to be an incredible 200-300 solar masses, but turned out to be only 100 solar masses. How heavy can a star be? This conundrum has haunted astronomers for decades. Theory indicates that there should be an upper stellar mass limit somewhere between 120 and 300 solar masses. Even though heavy stars are very bright, measurements of their masses can be complicated. The majority of the heaviest stars - some researchers say as many as 90% or maybe even more - tend to be born in multiple systems that can easily disguise themselves as single very heavy stars. 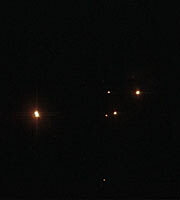 Moreover, these stellar heavyweights are so rare that only a few are close enough to the Sun to be examined in detail. One of the top candidates for the title of "Milky Way stellar heavyweight champion" was, until now, Pismis 24-1, a bright young star that lies in the core of the small open star cluster Pismis 24 (the bright stars in the Hubble image) about 8,000 light-years away from Earth. Pismis 24-1 was thought to have an incredibly large mass of 200 to 300 solar masses. 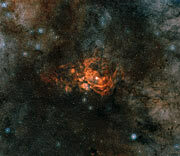 This would have made it by far the most massive known star in the Milky Way. New NASA/ESA Hubble measurements of the star, have, however, resolved Pismis 24-1 into two separate stars, and, in doing so, have "halved" its mass to around 100 solar masses. 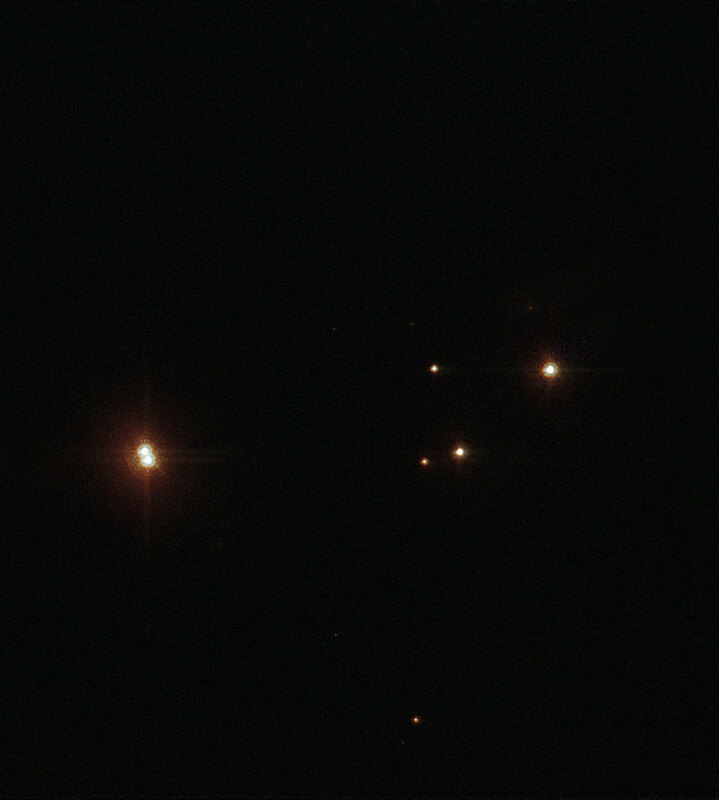 These impressive observations, performed by a team of astronomers led by Jesús Maíz Apellániz of the Instituto de Astrofísica de Andalucía in Spain, were obtained with the highest-resolution optical-imaging instrument aboard Hubble - the High Resolution Channel (HRC) of the Advanced Camera for Surveys. 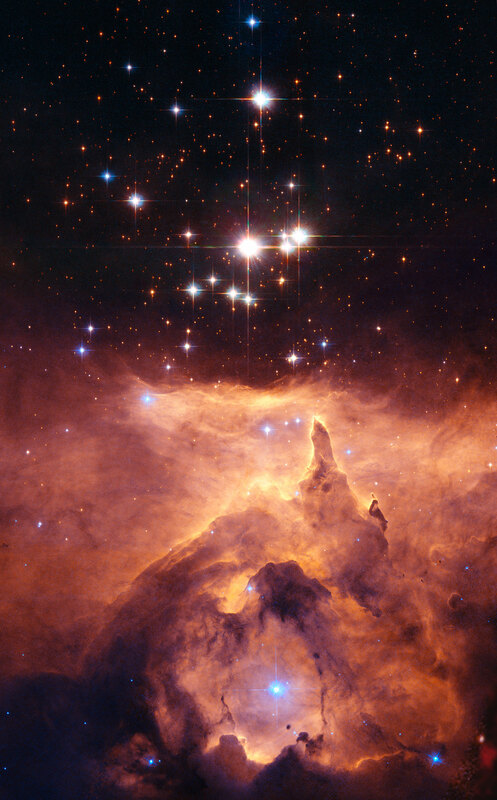 The star cluster Pismis 24 lies in the core of the large emission nebula NGC 6357 that extends one degree on the sky in the direction of the Scorpius constellation. 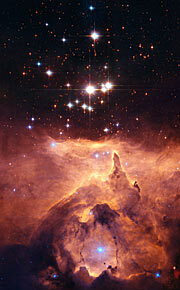 Part of the nebula is ionised by the youngest (bluest) heavy stars in Pismis 24. The intense ultraviolet radiation from the blazing stars heats the gas surrounding the cluster and creates a bubble in NGC 6357. The team also managed to determine the mass of another massive star in Pismis 24: Pismis 24-17. Its mass is around 100 times that of our Sun and brings the total number of heavy stars within this cluster to at least three, which is a very rare occurrence for a cluster this small: In our Milky Way, for every star with 65 solar masses or more that is born, another 18,000 solar-mass stars are produced. Furthermore, since a 65 solar-mass star lives for only 3 million years while a solar mass star can live for more than 3,000 times that long, there are actually millions of solar-mass stars for each very massive star. Pismis 24-1's "weight loss" may continue in the future: ground-based observations indicate that Pismis 24-1 could even be a triple star system. Although each of the three stars would then only average 70 solar masses, they would still make it to the top twenty-five for "Milky Way heavyweights", but only for a few million years as they would be sure to end their lives as supernovae and then turn into black holes. Jesús Maíz Apellániz's team plans to study the Pismis 24 cluster further and to look at other systems in the hope of establishing just how massive a star can be. Massive stars can be the precursors of either black holes or neutron stars, formed in the supernovae that are the final spectacular flaring of a collapsing massive star and the main sources of the heavy elements in the Universe. By studying massive stars astronomers gain a deeper insight into our current understanding of black holes, supernova explosions and the chemical composition of the Universe. The results of this study were presented at the Massive Stars Workshop in Argentina on December 2006.
Credit: NASA, ESA and Jesús Maíz Apellániz (Instituto de astrofísica de Andalucía, Spain). The team members are: Jesús Maíz Apellániz (Instituto de astrofísica de Andalucía, Spain), Nolan R. Walborn, Edmund P. Nelan (Space Telescope Science Institute, USA), Nidia Morrell (Las Campanas Observatory, Chile), and Virpi Niemela (Universidad de La Plata, Argentina). Note added on December 27, 2006: the ESA/Hubble team was greatly saddened by the news that Virpi Niemela, member of the scientific team responsible for this release, passed away last week on December 18th right after the workshop on Massive Stars mentioned above. 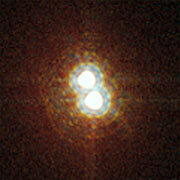 She was the first one in the group to become interested in Pismis 24, and published a paper on it 22 years ago in which she suspected that Pismis 24-1 might be a binary star. Her suspicion was confirmed as we can see in the images presented here. The scientists and the ESA/Hubble team would like to express their condolences to Virpi's family and to dedicate this release in her honor.